This statistic shows the average, high, and low costs of premiums for bronze and silver health care plans in the United States as of 2014. During this year, the average cost of a silver health care plan for a 27-year-old was 263 U.S. dollars. A premium is the amount paid for coverage each month. The plans differ based on the actuarial value which is the average percentage of health care expenses that are paid for the by plan, rather than out-of-pocket. In a bronze plan, 60 percent of covered medical expenses are taken care of and 70 percent in a silver plan. 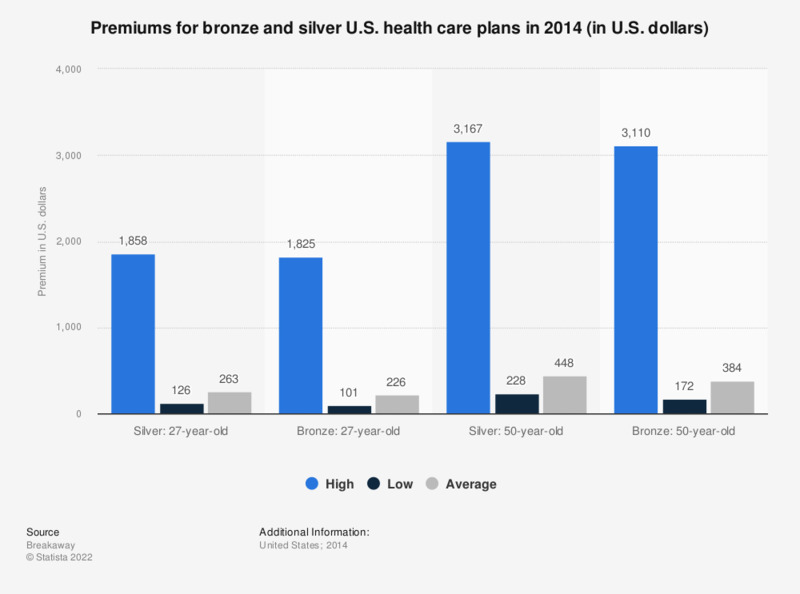 The premiums for bronze and silver health plans differ depending on age, ranging from a high premium of 1,858 U.S. dollars for a 27-year-old on a silver plan to 3,167 U.S. dollars for a 50-year-old on a silver plan. These plans also vary greatly in costs where a bronze plan for a 50-year-old can be a low of 172 U.S. dollars and reach a high of 3,110 U.S. dollars. As of 2013, 23.5 percent of U.S. adults between the ages of 26 and 34 were not covered by health insurance. The implementation of the country’s healthcare reform has increased the coverage of U.S. citizens but is not without controversy. Premiums for the average family are expected to reach 17,566 U.S. dollars with the Affordable Care Act (ACA) and up to 19,348 U.S. dollars without the ACA in 2018. Annual health insurance coverage has increased over the last decade from about 8,003 U.S. dollars in 2002 to 15,745 U.S. dollars in 2012 for families. The rising cost of health care insurance has lead many in the country to refuse insurance and has pushed insurers to increase the number of deductibles available to consumers. However, this forces many insured individuals to pay more for costs out-of-pocket.